Tata described the Racemo concept as a "test bed" to prove trickle-down innovation for the rest of the automakers lineup. 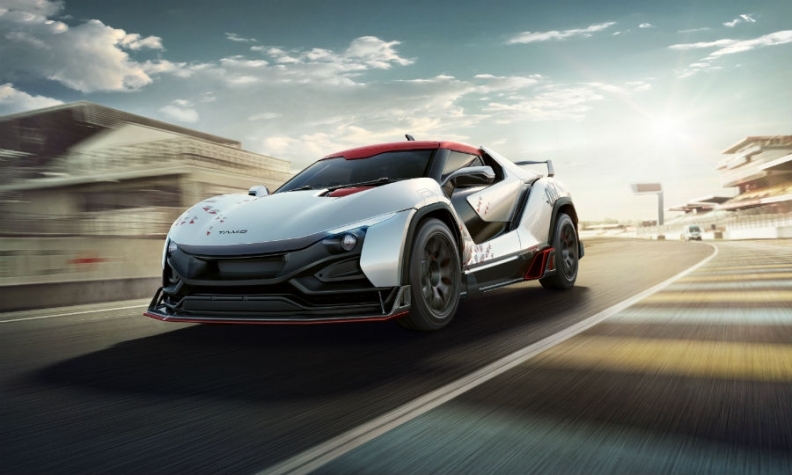 GENEVA -- India's Tata Motors showcased a preproduction versions of the Italian-design Racemo two-seat sports car from its new upscale subbrand, TAMO. The company said sales would begin in India later this year, but did not rule out eventually selling the model in Europe. "It might be a bold statement, but it actually represents our aspirations for going beyond the borders of India," Tata Motors CEO Gunther Butschek said at the Geneva auto show on Tuesday. Butschek called India the world's most demanding automotive market. "If you get India right, you are ready for the world," he said. The Racemo reflects that global ambition. Its connectivity technology, including navigation, predictive maintenance and over-the-air updates, was developed jointly with Microsoft. Tata's design studio in Turin, Italy, was responsible for styling. "It combines supercar cues with the practicality for use on Indian roads," said Tim Leverton, Tata Motors' head of engineering. Leverton said it would be premature to call the Racemo the first model in a new upscale brand for Tata Motors, whose Tata brand is focused on the low-priced Indian mass market. Tata Motors also owns the Jaguar and Land Rover UK luxury brands. "This is a specialist product, but our future products will be more mainstream," he said of TAMO. "It's a way of us also repositioning our brand, our brand image, right now to a more positive, innovation, technology profile." Leverton described the Racemo as a test bed to prove trickle-down innovation for the rest of the Tata Motors range. "We are using TAMO to prove the concept of these technologies, to do it quickly, and then be able to deploy those technologies onto the mainstream products," Leverton said. The Racemo's structure uses multi-material sandwich technology, the company said. Power will come from a turbocharged three-cylinder 1.2-liter gasoline engine, with 0 to 100 kph performance in less than 6 seconds. The body will meet coming Indian safety standards. "It's not an exotic car," Leverton said. But, he added, without revealing the expected price, "the Racemo's not a cheap car, and it doesn't look like a cheap car. In terms of what it offers it's quite affordable and accessible." Butschek noted that 65 percent of India's population was younger than 65, with "seamless" access to Internet connectivity. TAMO is a way for Tata to reach that upwardly mobile community who might not consider down-market vehicles. "We will sell a certain number of these vehicles, but we are trying to tap into a fan base -- the E-sports community, for example, -- to really highlight the elements of what they can find in Tata Motors," Leverton said. "We need to shift our position." Asked if European or global expansion was in Tata's plans, he said: “We will see -- I won't say never, but our main focus is to reposition our business in India." Tata Motors is a subsidiary of Tata Industries, a $100 billion conglomerate with interests in numerous companies and sectors, which bought the Jaguar and Land Rover brands from Ford Motor Co. in 2008 for $2.3 billion. Jaguar and Land Rover sales have surged under Tata's stewardship and investment, with more than half a million vehicles sold globally in 2016, including 221,758 in Europe, a 22 percent increase from 2015. But the Tata Nano minicar, a personal project of former Tata Industries Chairman Ratan Tata -- who attended the TAMO press conference -- that was conceived as the world’s most inexpensive automobile, has reportedly been a drain on Tata Motors' fortunes. It cost just $2,500 when it went on sale in India 2009. In an effort to improve efficiencies, Tata Motors said last month that it was reducing the number of its Tata-branded automobile platforms to two from six and would sharply cut the number of suppliers. In addition to the TAMO Racemo, the company showed two new mass-market models in Geneva, the Tigor, a sedan, and the Nexon, a small SUV, a segment that is surging in India thanks to models such as the Renault Kwid.